Colorado River, USA: Today at 10am Mountain Time, the State of Colorado, Water Conservation Board, is holding a ‘webinar’ on its “Drought Contingency Plan” for the Colorado River. The Plan proposes to address the ongoing drought and the State of Colorado’s solution to the problem of falling water levels at Lake Powell. The Plan includes further draining Colorado’s “Blue Mesa Reservoir”, which already hit its lowest point in history in 2018 (see news report here about low reservoir levels and toxic algae), as well as buying hundreds of thousands of acre feet of water from thousands of farmers in Colorado, all to try and run water downstream to save Lake Powell. Save The Colorado contends that the Plan’s proposal to try to save Lake Powell is a lost cause. 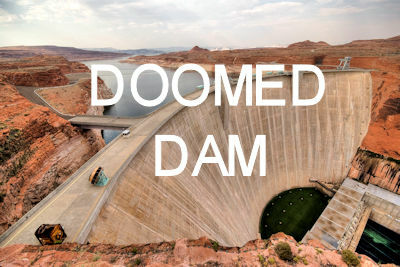 In fact, former Commissioner of the U.S. Bureau of Reclamation, Dan Beard, co-authored an op-ed in the Sept. 18 Denver Post, titled, “Tear Down Glen Canyon Dam and Drain Lake Powell for Water Supply Security” (link here). Beard is a boardmember of Save The Colorado and co-authored the op-ed with Gary Wockner, director of Save The Colorado. Save The Colorado also posted a blog in April of 2018 (here) doing the simple back-of-the-envelope math for how much water is needed to try and save Lake Powell, how much it would cost, how many farmers would be put out of business. The analysis suggests the Upper Basin, including Colorado, would need to spend about $3.1 billion to buy-and-dry 1 million acres of farms in Colorado, Utah, and Wyoming to make a consequential difference in saving Lake Powell. This Tuesday, Oct. 9 at 10 AM, the State will host a webinar entitled “Colorado River Drought Contingency Planning Implementation.” Join Colorado River Commissioner James Eklund and CWCB staff on Tuesday, October 9th for a webinar entitled “Colorado River Drought Contingency Planning Implementation.” This webinar will discuss the recent challenging hydrology on the Colorado River, and the efforts of the seven Colorado River Basin States and the federal government to address the declining levels in Lakes Powell and Mead. Commissioner Eklund and staff from the CWCB and Attorney General’s Office will review the process and draft implementation documents for the Upper and Lower Basin Drought Contingency Plans (DCPs). Panelists will discuss the opportunities the implementing documents provide, as well as the elements which will require more close work with Colorado stakeholders, such as the feasibility of demand management in the Upper Basin. CWCB and AGO staff have been speaking at public events and policy forums for the past year, describing the DCPs and their potential elements as those evolved. Now, join us to discuss the timeline moving forward, and the draft documents that would implement these new measures to protect levels at Lakes Powell and Mead, and provide greater certainty for Colorado water users. For those who are unable to view the webinar at this time, a recording will be posted on the CWCB website shortly after the webinar concludes. Thank you to Colorado Water Congress for hosting! Or dial in using your phone: +1 669 900 6833 or +1 929 436 2866; meeting ID: 692 552 832. Robert Redford -vs- Will Farrell: Raise The River? Or Move The Ocean?